We've been visited a few times by this young man who's got his eyes set on a Trek road bike, SLX I think. Pretty sure he's brought in his parents and maybe Grandma or a caretaker or maybe all of the above; I think he wants everyone in his life to know how cool that bike would be for him. He's been so bitten by the cycling bug that he reads and perhaps even relates to some of the writings of my almost-daily-diary. When I was in his shoes, let's see... hmm... OK, I was 10 or 11 at the time when I fell in love with the idea of a road bike. That would be... oh my... 43, almost 44 years ago! 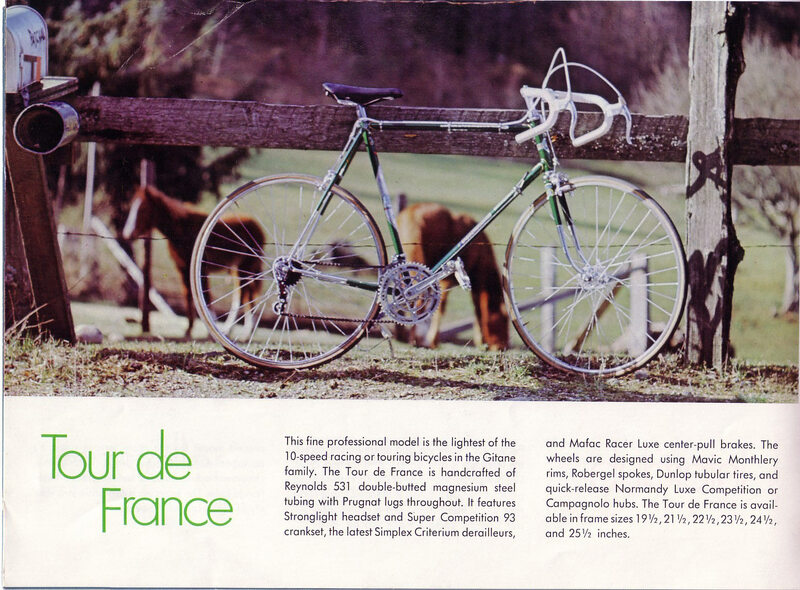 I'd saved up money from my paper route to buy an "Orly Tour de France" for $49 from Macys. I'd love to see the ad that enticed me to buy that bike, but truthfully, I don't recall. I just remember that there was no way I could afford a Schwinn Varsity (the bike that Captain Kangaroo said I should have) (back when a Schwinn was a bike worth having) because they were $73 at the time, and this "Orly Tour de France" was just $49. So I bought it with the paper route money and, a year later, had enough to buy the Schwinn Varsity (not realizing until almost three years later that the Orly was a far better bike!). That's me, at the right, in my first race on my Gitane Tour de France. Cutoffs, leather helmet, t-shirt, nobody will deny the humble beginnings of my bike racing days! That young man who's been coming into the shop is at my "Orly" stage right now. Actually, he's almost gone past that, because I didn't really feel the way he does about a new bike until it was time for my first "real" racing bike, a Gitane Tour de France 1. For that bike, I had to gain support from my parents, since it was an outrageous (for then) $236. My technique was masterful; I convinced my father that the bike I was lusting after was the Gitane "InterClub" model, about $140 (still a lot of money for 1970 or '71). And once I convinced him of the reasonableness of that bike, I then moved things up to the bike I actually planned to get. There was simply no way I was going to convince my father of the wisdom of a 15 year old buying a bike that cost the equivalent of maybe $1500-$2000 today in one swift motion. Yes, even though it was entirely my own money, it was still important, and perhaps required, that I have his approval for the purchase. Maybe the young man I'm talking about (the one wanting the SLX, not me!) looks at that bike and sees the future. A machine capable of altering his space-time continuum by giving him a bit of independence and control over his surroundings, and multiplying his own physical capabilities. A discovery that real life adventures can be far more intense and satisfying than what you get with a computer game's faux realism. As we get older, it becomes increasingly difficult to find such long-lasting excitement in such simple things. We have our desires, sometimes our impossible (or unwise! )-to-attain fantasies, but once we get them, much if not all of the thrill is gone. But this young man has reminded me of the magically-transformative and lasting powers of the bicycle. There is no question that my cycling has helped me get through life more successfully, falling to fewer temptations, and healthier than I otherwise would have been. It's been that solid foundation that I can depend upon, no matter what. Marriages have fallen, nations have crumbled, brilliant minds lost because someone didn't have... a bicycle? Maybe that's a bit (bit?) over-the-top, but only a bit.